Two UEFA Cups, three league titles, a European and FA Cup and a tally of 100 goals: the number seven left the Kop with a multitude of magical memories. 'Robbery with violence' was how Bill Shankly described the capture of Keegan from Scunthorpe for a measly £35,000. Although he'd been signed with a view to replacing Ian Callaghan in midfield, the confident new recruit immediately impressed in an attacking role during pre-season. So much so that he was handed a surprise debut at home to Nottingham Forest on the opening day, an occasion he marked with a goal after just 12 minutes. Revelling in his new-found fame, KK didn't look back, forming an almost telepathic partnership with John Toshack that would become one of the deadliest in the game. Energetic, enthusiastic and 100 per cent committed to the Kop cause, Keegan was a born winner who provided Shankly's second great side with the spark that ignited a renewed assault on the major honours. His first season at the club may have ended trophyless but the foundations had been laid and in 1972-73 the forward fired Liverpool to an unprecedented domestic and European double. He topped the Anfield goalscoring charts in the process and netted what proved to be a crucial brace in the UEFA Cup final first leg against Borussia Moenchengladbach. Another two-goal Keegan blast clinched FA Cup success the following year as Newcastle, a club he'd go on to play for and manage, were overwhelmed at Wembley. The effervescent attacker had already struck four times en route to the twin towers, including a perfectly lobbed effort over Leicester's Peter Shilton in the semi-final replay at Villa Park. Fast, skilful and courageous, he was a handful for opposition defenders and was by now widely regarded as one of the finest forwards in the land. Despite standing at just 5ft 8ins tall, he was surprisingly adept in aerial combat and, as Leeds skipper Billy Bremner discovered to his cost, could also pack a punch. Sent off for trading blows with Bremner in the 1974 Charity Shield, the first to be held at Wembley, Keegan caused further outrage by stripping off his shirt as he left the field. He was later slapped with an 11-game ban but emerged from this controversy more determined than ever. The 1975-76 campaign was to be his finest as a Liverpool player, with his all round play and crucial goals – notably away to Wolves and Bruges - proving instrumental in yet another league and UEFA Cup double. Keegan's efforts were rewarded with the Footballer of the Year accolade, and he still found time to fall off his bike on TV show Superstars and splash Brut 'all over' with boxing legend Henry Cooper. But, with the recently appointed England skipper's stock rising on and off the pitch, speculation mounted that several clubs from abroad were circling. 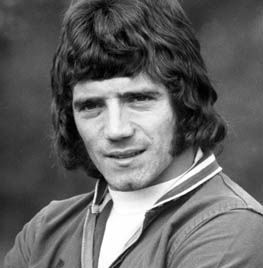 On the eve of the 1976-77 season, every Liverpudlian's worst nightmare was confirmed when Keegan served notice of his intention to quit the club and join Bundesliga outfit Hamburg in twelve months' time. His decision was understandably met with disdain from certain sections of the Kop and his once soaring popularity dipped significantly, with some fans questioning his loyalty. Credit where credit's due, though: he knuckled down and got on with the job of aiding Liverpool's 13-year quest for European Cup glory. It may not have been a vintage campaign personally but it was to end on the ultimate high in Rome. Four days after being made the scapegoat by some for the FA Cup final defeat by Manchester United, which had scuppered dreams of the treble, Keegan won back the everlasting affection of the supporters with a dazzling performance against Borussia Moenchengladbach. On a balmy night in the Olympic Stadium his tireless work-rate and close control bamboozled experienced German international Bertie Vogts to such an extent that he had no option but to bring him down for the penalty that sealed a momentous victory. There could have been no more fitting way for Liverpool's star of the Seventies to pull the curtain down on an illustrious career with the Reds. Keegan may have gone on to be crowned European Footballer of the Year twice during his spell in Germany but it was at Anfield where he enjoyed his greatest success. One of Liverpool Football Club's favourite sons, there'll always be a special place in the heart of the Kop for Kevin Keegan.